Jerry Bardoe has been running this highly respected carpentry shop in Antigua, for over 31 years, during which time they have worked on all the J Class, and many other high profile yachts, both charter and private. They specialize in interior joinery, veneers, wooden spars, cap and toe rail repairs. They work with quality marine ply, teak and other hardwoods and can also work with Corian and Perspex. They pride themselves on providing a professional service, with “no job being too small'. Chippy has a reputation for standing by their work, and any isolated quality problems that may arise are always tended to without issue. Along with their usual yacht cabinetry /carpentry work, Chippy has also re-caulked and re-laid major decking projects using the solidly effective “Teak Deck System “ caulking. In the off-season, when not doing refit work, Chippy’s talents extend to numerous varied projects including much of the furniture in the restoration of Clarence House, the bespoke bar at Jumby Bay Hotel as well as the wooden structures and sails for the sugar mill at Betty’s Hope. 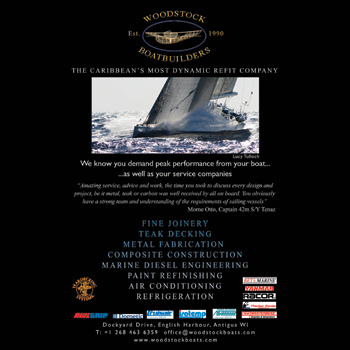 Their workshop is located on the main road between the Catamaran Marina and Cobbs Cross... though they'll serve yachts in any location. Chippy also carries out warranty and insurance jobs for many of the major yacht builders.